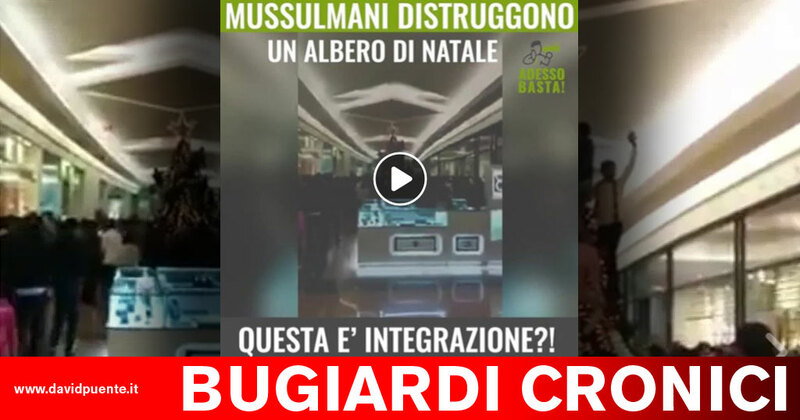 Mussulmani distruggono un Albero di Natale in un Centro Commerciale! Regardless of their identities, none of them are disrespecting Christmas or trying to destroy the Christmas trees in either of these videos. The event shown in both videos are actually both typical customs observed in both Europe and the Middle East amongst both Muslims and Christians alike called “Christmas tree plundering” or “shaking the Christmas tree”. This event marks the end of the Holiday season, wherein Christmas trees are stripped of their ornaments, namely things like candy canes, apples and crackers, and they’re given to the children. The custom originated in Sweden, but has spread to the Middle East. Remember earlier in this article how it’s been claimed so often that Muslims have vandalized Christmas trees in Sweden? The tradition in Sweden and in Finland to plunder the Christmas tree is on Tjugondag Knut or St. Knut’s Day on January 13. This is the day when Christmas is ‘thrown out.’ It is literally the case these days as this is the date when you usually throw out a Christmas tree that is shedding needles badly and seems to have done its part to enhance the Christmas season. Per i gestori di “Adesso Basta” non si tratta della prima volta, già in passato hanno diffuso bufale come ad esempio quella della Kyenge contro i mercatini di Natale (ne parlai l’anno scorso). Evitate di quella pagina e il relativo sito internet, fate un favore alla vostra cultura.